Who would go on to face Asuka at Wrestlemania? 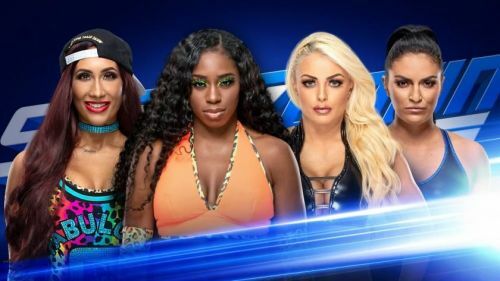 WWE announced a fatal four-way match among Mandy Rose, Sonya Deville, Naomi, and Carmella in order to determine the #1 contender for Asuka's Smackdown Women's Championship. While the friction between the Fire and Desire remains to be the focus of the match, there's also Naomi and Carmella competing to get a shot at the women's title. Carmella is clearly in the match just to take the pinfall while the others have a chance to feature on the WrestleMania card in the women's title match. Naomi has finished her program with Mandy Rose and has no clear path for WrestleMania at the moment. She was the winner of the women's Battle Royal last year which led her nowhere. But, next week she has a chance to get a shot at the women's title. And therefore, here are 5 reasons why Naomi should win the Fatal four-way match and face Asuka at Wrestlemania. The contracts of the Usos are up just after Wrestlemania and they are rumored to leave the company for a better stage for tag-team wrestling. This is why they were made the Smackdown's Tag Team Champions in order to convince them. Naomi, in all probability, would also be leaving the company alongside her husband Jimmy Uso if the Usos indeed don't re-sign. There were rumors that Jimmy Uso and Naomi were knowingly trying to get fired by the WWE during the former's arrest incident. A title match at the Grandest stage of them all might lure Naomi to renegotiate with the WWE and stay with the company. Even a title victory over Asuka might be offered to her in order to make her stay. Moreover, Naomi is a recognizable figure with her Total Divas stint and WWE can't let AEW have a household name with mainstream attention under their banner.